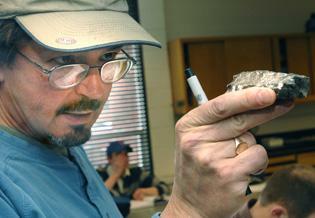 several Illinois State University geology professors. shape of deck of cards. Geological Survey's meteorite center in Flagstaff, Ariz.
the possible meteorite hit the home was at least 60 miles an hour. she heard the crash and felt the house shake around 9:30 a.m.
"We were just lucky no one was sitting at the computer when it happened." the computer desk putting a hole through the particle board. Bloomington residents David and Dee Riddle at 9:40 a.m. Monday morning. was also a thump and a shake." their bedroom in the back of the house. "It took me 15 minutes to look for it and then I found it," she explained. After the object was spotted, she called the police to file a report. "When I told them what I thought it was, they thought I was crazy,"
Riddle said. "Then they saw it and called the sergeant to look at it." the ballistics of the impact. "They did say it was a meteorite, but it needed to be tested," Riddle said. general education lab coordinator for the department of Physics, said. percent sure this is a meteorite. It is uncommon for meteorites to actually hit the ground. the department of Geology, said. "It is rare for them to land." "This is the first one that has even been close," he explained. said. "Also, acid etching can be done, to determine its crystal structure,"
it is in fact a meteorite. Bloomington, Illinois, home may be wood-chipper debris. cabinetmaker with experience in repair of meteorite damage. Or...Anybody know a good lawyer? not be a legitimate meteorite." at Arizona State University in Tempe. object." A fresh meteorite, even if it contained iron, would not be rusty. determine that it was, indeed, a fresh meteorite that fell from space. it, indicating the presence of iron. which metallic meteorites typically contain. Meenakshi Wadhwa studies the oldest rocks on Earth—meteorites. © The Field Museum, gn87845.2. couple's home last month was not a meteorite but something man-made. being a meteorite," Nelson said. house, Nelson initially thought it could have been a meteorite. university scientists within days of learning about it. would have traveled about 300 meters, or roughly 900 feet. "The force to push it that far would have been pretty great," Nelson said. couple of hundred miles an hour," Nelson added. Dee Riddle said she, too, is surprised by Nelson's theory. "I just don't understand how that could have traveled that far," she said. from the machinery but may have been something mixed in with the wood.